Add a visually stunning and natural look to every room of your home with our gorgeous Wood Weave Roman Blinds. Our made to measure wood weave roman blinds are a gorgeous way to dress your window. Made from natural resources, including bamboo, poplar and jute woven together, they compliment your home beautifully. 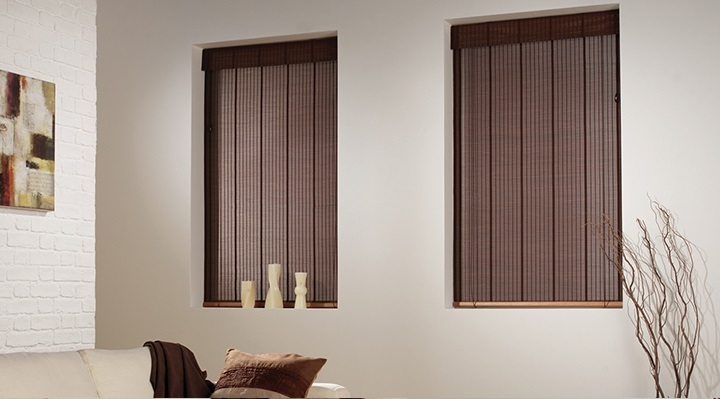 Wood weave roman blinds can be simply face or top fixed and can be ordered with either matching or contrasting tapes. As with fabric roman blinds, wood weave roman blinds can be released fully down and flat against the window or pulled up creating even folds that can be set at any height including fully up and hidden behind the pelmet. We stock many shades and weaves to match your decor perfectly. Please click here to view our Wood Weave Roman Blind Range. For a Woodweave Roman Blind quote, please fill in the form below and we will get straight back to you.